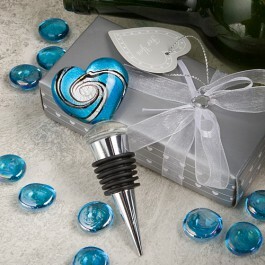 Add a hint of Italy to your next event with a unique and intricately designed Murano heart glass bottle stopper. This piece is a mini work of art. Guests will love the beauty of the Murano glass and they make a wonderfully unique favor or hostess gift. Each glass bottle stopper is nestled in white satin inside a distinctive Murano Collection silver box with white heart designs, and tied with a white organza ribbon. The package is finished with a heart rhinestone embellishment and attached heart shaped "For You" tag.